There’s an incredible deal on offer right now over at Innoxa—50% off everything in the entire range! I’ve still only tried a few products from the Innoxa range before (see my earlier review of the Innoxa Restore Ultra-Lift Moisture Lotion SPF15), so I’m currently shopping up a storm. The organic skin care range products and gift packs (for Christmas presents) are featuring highly. 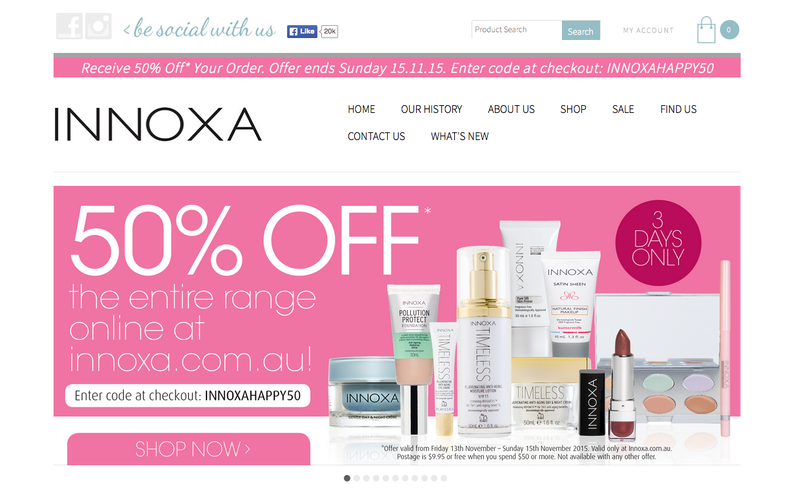 To get the discount simply enter promo code INNOXAHAPPY50 at checkout. Hurry however as the deal ends tomorrow (Sunday 15 November). Oh, and all orders over $50 also receive free shipping—another reason to buy lots!